I attended one of the worst junior high schools in the Greater Boston area. It stood for 100 years, pumping out students who were mostly ill-equipped to handle the rigors of high school. There were two types of kids there: the tough kids and the smart kids. The tough kids were the sons and daughters of gangsters or future gangsters. Most had lingered at the junior-high level well beyond the minimum of three years. Not only were they tough, they were also pretty old and big for junior high school, which made things that much worse for the rest of us. I was one of the smart kids. Sadly for me, smart kids bore the brunt of the tough kids’ harassment. Hardly a day went by when someone did not confiscate my lunch money, knock my books out of my arms, or push me onto the weedy school yard blacktop. On particularly bad days, a tough kid would threaten to burn me with a cigarette. Summer vacation was like a reprieve from prison. Of course, the smart kids got their revenge later in life with good jobs, nice families, and houses in the suburbs. Most of the tough kids ended up spending their remaining days in the Cedar Junction or Norfolk prison. At least, that was my wish. My fantasy back then was to be a tough, smart kid. I wanted to have it both ways. I liked school. I liked to create things. But I also wanted to be like the tough kids—to be one of them and feel a sense of power. For me, there is an analogy between my junior high experience and the current state of affairs with smart grid. Today we are spending a tremendous amount of energy, thought, and money on computerizing the electric utility grid with two-way communication technology, including smart meters and self-healing systems. This is all good and will modernize the grid. However, the storms that have torn apart electrical systems remind us that for all the smarts we are installing into the grid, it can’t stand up to the bully that is Mother Nature. She regularly pummels the grid, oftentimes unannounced, leaving millions stranded for days or even weeks without power. What we need is a tough, smart grid, one that can outsmart and withstand the fury of Mother Nature—a fury that seems to get worse each year. We also need a grid that operates within the context of society. Geospatial technology can help in a number of ways. With geospatial technology, utilities can fully understand the cost of a major power disruption. Today’s power companies don’t do that effectively. 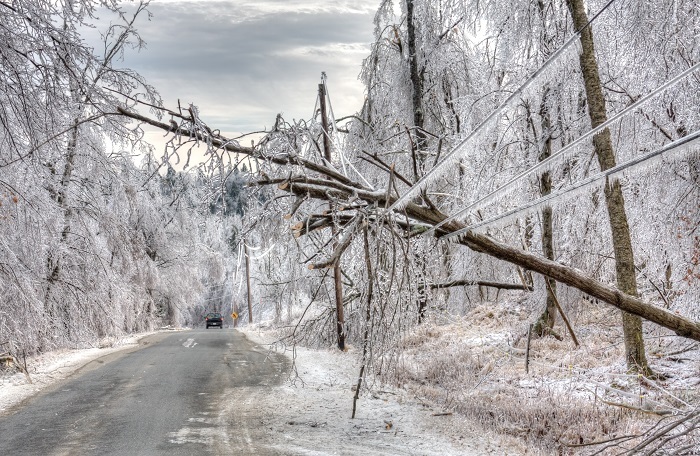 Most utility operators have a solid understanding of their company’s costs; they know how much they need to spend to rebuild the network after a major storm. They can easily calculate lost revenue from power failures. And this cost is minor compared to the cost to society. However, when customers are asked if they are willing to pay more for electricity for a tougher grid, ironically, most say no. Of course, we rarely run those surveys during a significant power failure. To help this cause, governments, in conjunction with utilities, can perform a spatial analysis using geographic information system (GIS) technology to map a community’s losses due to power failure. With GIS, governments and utilities can visualize by location the amount of spoiled food, lost business, and even loss of life. With that information, society can get a better handle on the true price of a power failure, not just the utility’s cost of rebuilding and restoration. With that in hand, communities—not just the power companies—can better assess the value of creating a grid that’s both tough and smart. Utilities can also use spatial analysis to gain a better understanding of the vulnerability of the grid itself. They can easily do this by mapping the factors that contribute to a failure—things like the age of equipment; lines running into treed areas; poles in sandy, wet soil; and recent tree trimming and maintenance activities. With this information displayed in GIS, utility operators can determine the impact of a power failure by area. They can assess power loss in large populations or critical facilities including shelters, water pumps, and telecommunications centers. It’s relatively straightforward to evaluate this risk: calculate vulnerability plus impact. Utilities can intersect an area’s risk profile with the network as represented in the GIS and then determine the highest-priority areas where the system needs to be toughened up. Bolstering those areas of the grid might include a combination of underground looped systems in conduit, concrete poles, spacer cable, insulated cables, reinforcement, and some new technology. During Superstorm Sandy, for example, the power companies that served the affected region discovered new vulnerability to flooding. Utilities need to know where weaknesses are and how to strengthen them. Knowing that a piece of electrical equipment is vulnerable is the smart part—fortifying such assets is the next part. Finally, utilities need to be greater participants in communities and the use of big data. The power grid is not an island unto itself. Sensors, video feeds, and Wi-Fi connections are becoming ubiquitous. Big data is captured every second in most cities. Local governments are intensifying their efforts to learn as much as they can about the behavior of their cities, yet utilities rarely leverage more than a fraction of that knowledge. Smart grid needs to be part of an overall smart community plan. Sure, Esri ArcGIS is a platform for access, awareness, and analytics for all things spatial, but it is also a collaboration platform. GIS provides an ideal way for utilities to collaborate on smart community initiatives, leveraging sensor data and imagery to better anticipate not just power failures but also how the community is evolving. Utilities can understand residents’ habits, movements, and carbon footprint. We don’t need a smart, geeky grid that gets beat up regularly. We need a tough, smart grid that can stand up to the realities of nature and be an equal participant in the communities of the future.